This is a beginners howto that illustrates the first steps working with airprobe and the USRP. It is intended for beginners to get a bit more fammiliar with airprobe and the GSM radio interface. For recording GSM-Data your USRP should be equipped with the DBSRX-Board in RX A. You also should have a suitable antenna but a piece of wire also should do the job. It is good to live in a big city because in urban areas you will have lots of small cells in a thight mesh. You should compile and install the latest gnuradio version. It is good to have a test signal source such as a GSM-Basestation or a GSM-Radio test set. Productive GSM networks are good signal sources as well but sniffing them might be a punishable offence. So it is recommended to perform all tests in a professional shielded environment. bug, please email to: philipp.maier@runningserver.com - Thanks! So we now know the Arfcn and the Frequency of a non hopping transceiver. We now could use airprobe to sniff some of the beacon traffic. But we stop here because there is a high risk to infringe other peoples privacy. So we stop here and use suitable test equipment as test signal generation. Besides doing so is a lot better because we will have full control over the network parameters. But before we begin with the airprobe tests we want to learn something about the modulation. Press the pause key to halt the baudline waterfall. Press right mouse key ==> Displays ==> Waveform. Now you should see the waveform in time domain. Now fumble over the spectrum and look at the time domain. 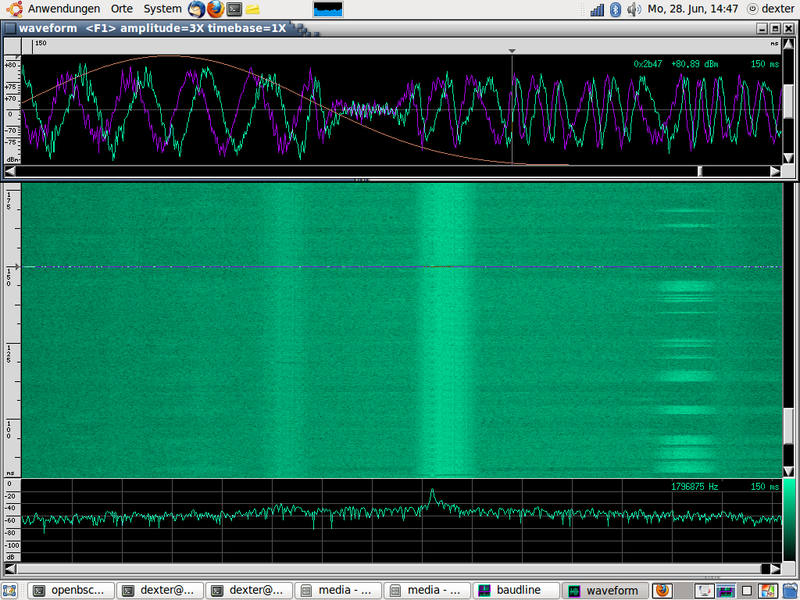 You can see the phase shift of the GMSK modulation. With a lot time it should be possible to decode the data with pen and paper. In the image the window cursor was positioned at the edge of a synchronisation burst. Look hat the waveform windows. You can see a sine at the left and lots of phase shift at the right. The sine is used as a frequency standard for taming the local oscillator in the phones. Now its time to get familiar with airprobe. Airprobe is a collection of tools and code that allows you do do some basic protocol analysis to the GSM air interface. The tools are unfinished. They should be understood as the result of some experimentation and not as a solid toolkit. However. There is no alternative and maybe you will be the next wo improves the tools - so lets get it on! For our tests we used a BS11 with openBSC. Our network name is "Vaderfone" (We are funny today, Ha ha!) with MNC=01 and MCC=001. It is just the basic openBSC setup with no freaky extras like encryption and so on. The BS11 works on a dummyload which decreses the coverage to less then 50cm. Bevor operation make sure that you use a free Arfcn because you won't get disturbed by the official providers. 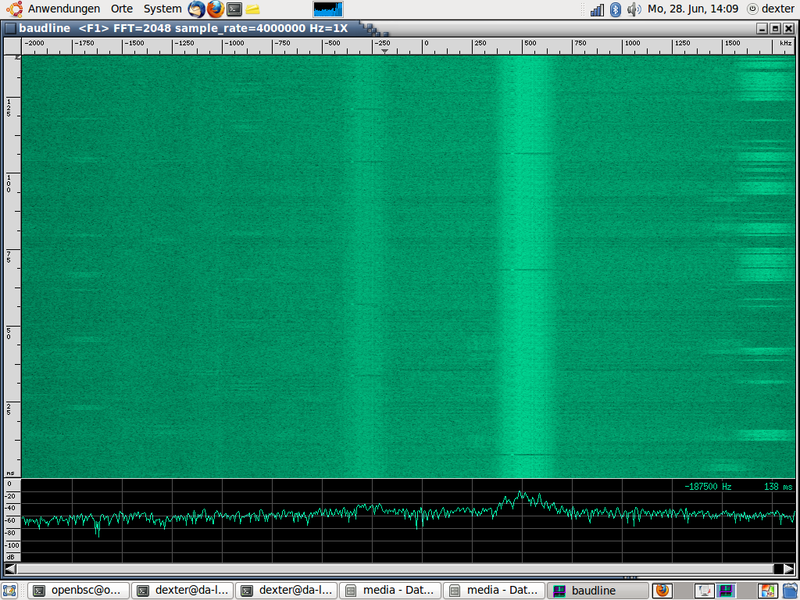 We had to move the USRP very close to the BS11 to get an acceptable signal level. In our case we used Arfcn 121 because it was unused. During the capture no phones were logged into the network. This is what the spectrum looks like. Left and right we see the other providers transmitting. Don't worry. We do not desturb anyone because our range is limited to about 50cm. So this should be legal. The next task is to operate airprobe/gsm-receiver the right way to strip some useful data out of the Carrier. cd to ~/airprobe/gsm-receiver/src/python$. You should see two scripts named go.sh and capture.sh. The names should be self explaining. 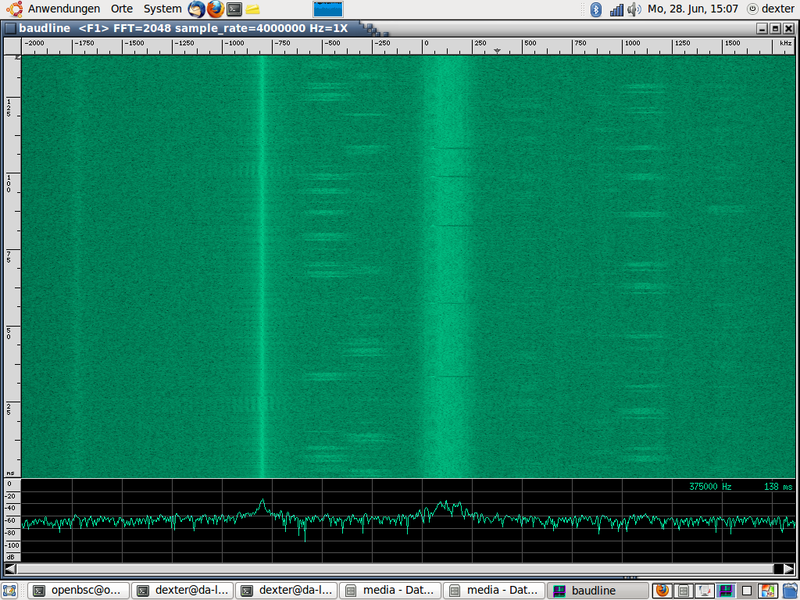 Before we can capture some data we calculate the downlink frequency with arfcncalc as shown above. 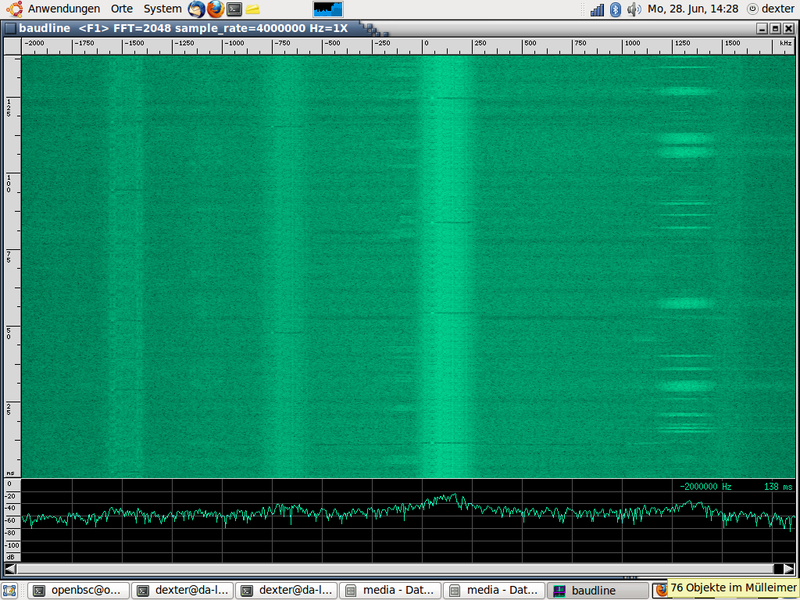 If you take a closer look to what happens you see, the normal gnuradio toolchain (usrp_rx_cfile.py) is used here. Nothing special yet. When the run is complete you should have a file named capture_959200000_112.cfile in the local directory. 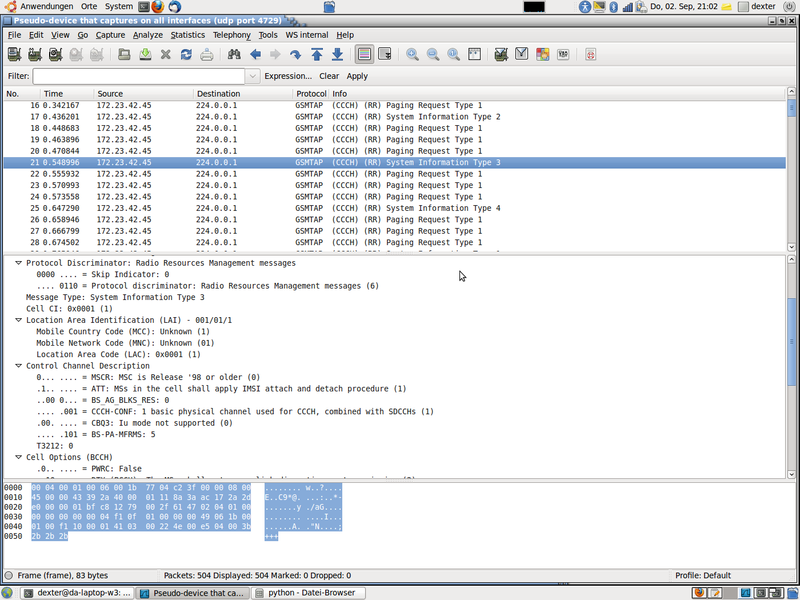 When the dissector has finished decoding the captured data you can view the results in wireshark. After decoding you might want to go deepr. For example you will not see any SDCCH since they are encrypted on the oder side and they are allocated on demand they are not decoded automaticly. The first parameter is the decimation, the second says "the first SDCCH" and the last is the Kc session key in Hexadecimal. Note: The Kc can be easyly determined by removing the accu from the telephone immeadiately after making a testcall. Then you cen read out the EF:KC in DF:GSM. The ChipcardLab? ( http://www.runningserver.com/software/chipcardlab.tar) has a solution for this.